The objectives of the mission were to undertake a stocktaking of relevant initiatives on climate mainstreaming, review institutional capacities, and suggest next steps to advance the NAP process in Niger. The mission was requested by the Conseil National de l'Environnement pour un Développement Durable (CNEDD). More than 25 meetings with sector ministries, donor organisations, research institutions and international NGOs took place over the 10-day mission. CNEDD, Ministry of Planning, Ministry of Finance, and other multi-sector groups were consulted, including sectors of transport, water, agricullture, environment, health, and education. 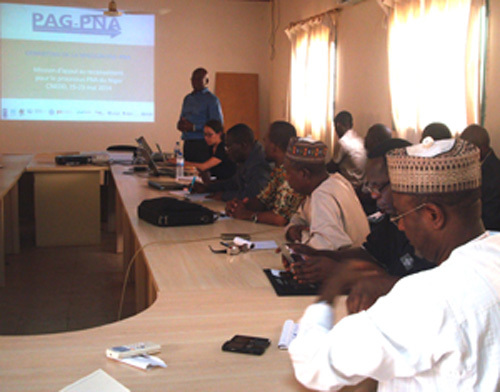 Technical and financial partners consulted included UNDP country office, GIZ, Care International, IRD, GWP-Niger and CFAO. Meetings also took place with the French Embassy and the EU. The assessment concluded that the NAP process in Niger offers opportunities to generate greater awareness of climate risks at decision-making levels. It can help build institutional capacity for climate change coordination for key actors such as CNEDD, Ministry of Planning and other key actors and initiatives. It can assist in addressing climate risk in long term development planning by mainstreaming climate adaptation in Niger’s upcoming Vision 2035. In sectors, the analyses of climate scenarios, assessment of vulnerability factors and training on cost-benefit analysis could assist capacity development for appraising climate adaptation options for national and sector processes. At local levels, the process can support the implementation of the local development plans in municipalities - including the establishment of local early warning systems (EWS), better access to information, and availability of communications products targeted at producers. Further stocktaking conclusions and recommendations are contained in the de-briefing presentation below. The NAP-GSP team and partners are continuing their ongoing support to Niger in the NAP process.